The undercard featured three dominating performances by Roman “Chocolatito”Gonzalez, David Lemieux, and Jaime Munguia where they all stopped their opponents. The HBO Announce Team had to kill ninety minutes of airtime after the last undercard ended, as the walkout wasn’t scheduled to start until 11:00PM EST. A lengthy discussion about their prior fight and controversy with the scores and result ensued. Golovkin, the champion, came out first to a somewhat muted reaction. Canelo Alvarez was met with a mixture of cheers and boos. The national anthem was not sung. Golovkin and Canelo rush out to the center of the ring and Golovkin established control of the middle. 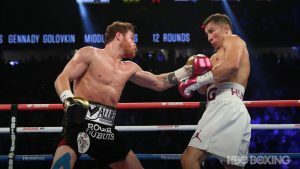 Golovkin trades jabs with Canelo. Golovkin lands two jabs and Canelo lands a right hook to the body. Canelo lands another jab and Golovkin answers with on of his own. Golovkin slips a jab from Canelo. The crowd is chanting very loudly. Canelo misses with an up jab. Canelo snaps out a jab. Golovkin misses with two jabs. Canelo bangs a right hook off the guard of Golovkin. Canelo misses with a hook to the body. They both land a jab at the same time. Canelo lands a sharp jab. Golovkin lands a good jab. Canelo sneeks in a lead left hook. Golovkin lands a straight right hand. Canelo digs in a hook to the body. Golovkin lands two good jabs in the last ten seconds. Close round. Canelo lands a reaching jab upstairs. Canelo lands a double left hook. Golovkin snaps a jab in the face of Canelo. Good lead uppercut by Golovkin. Vicious lead left hook by Canelo lands on Golovkin’s chin. Canelo snaps another jab in the face of Golovkin. Canelo goes for the lead uppercut again. Canelo lands a good right uppercut to the body of Golovkin. Canelo lands another jab. Golovkin lands two lead left hooks. Golovkin has a cut by his right eye. Golovkin lands a good two punch combination and sharp jab. Good body blow by Canelo. Golovkin with a lead left hook, and another lead left hook. Golovkin sneeks in a straight right hand. Good round for Canelo. Golovkin barely misses with a counter straight right. Golovkin snaps out twi jabs and Canelo answers with some jabs of his own. Golovkin lands a right uppercut to the body. Good jab by Canelo. Good left hook by Canelo and Golovkin lands an uppercut in response. Golovkin barely misses with a good straight right. Golovkin bobs out of the way of a straight right hand. Canelo barely misses with a straight right hand. Canelo pressing forward and Golovkin lands a straight right hand. Good straight right hand by Golovkin and Canelo barely misses with a left hook. Golovkin lands a right cross. Golovkin lands a jab and Canelo lands a jab in return. Golovkin barely misses with a right uppercut. Canelo lands a good combination to the body. Golovkin opens up with a left hook to the body. Canelo lands a short jab and Golovkin answers with two uppercuts to the body. Canelo lands a short jab. Canelo is the quicker puncher. Golovkin lands a short jab and Canelo lands an uppercut in response. Golovkin lands a good short uppercut followed by a left hook. Golovkin lands two good jabs in a row. Golovkin lands a hard right uppercut. They’re going back and forth and taking good shots. Golovkin lands a good left hook to the body. Canelo looks fresher though Golovkin is having a good round. Golovkin lands a lead left hook followed by two jabs. Golovkin ducks a jab from Canelo. Good jab by Canelo. Golovkin with a good right cross to the body. Good exchange in the middle. Good double left hook to the body by Canelo. Golovkin lands a good jab near the end of the round. Golovkin lands a cross to the body and Canelo answers with a short uppercut. Golovkin three quick jabs. Good hard jab by Golovkin and Canelo misses with an uppercut. Good uppercut by Golovkin and Canelo lands a good body shot. Canelo with a jab to the body. Good right cross by Canelo. Golovkin with a good right cross. Golovkin with a lead left hook to the chin. Golovkin with a short hook to the temple. Golovkin is circling on the outside. Canelo barely misses with a wild hook. Golovkin lands two short jabs. Canelo lands a good jab from a distance. Canelo lands a good combination to the body of Golovkin. Canelo is swinging for the fences. Golovkin lands a good right cross to the body. Canelo may have a cut near his eye. Golovkin lands a short up jab. Canelo lands a good left hook to the body and barely misses with a right cross. 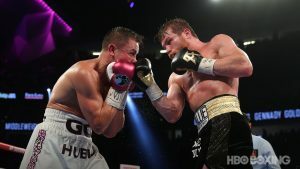 Canelo digs in a hook to the body of Golovkin. Canelo has a cut by his left eye. Good jab by Golovkin. Canelo snaps out two jabs. Golovkin lands a lead left hook. Good right cross to the temple by Golovkin. Golovkin lands a left hook and Canelo lands a vicious left hook. Golovkin lands a lead left hook followed by a right uppercut. They both land right crosses. Canelo with a good left hook to the body. Golovkin takes a good jab by Canelo. Golovkin looks like he is tiring. Canelo pressing forward. Golovkin lands a good short jab. Canelo lands a short left hook and Golovkin lands a right cross. Canelo is pressing forward on Golovkin. Canelo lands two short uppercuts on Golovkin followed by a reaching left hook to the chin of Golovkin. Canelo digs in another right hook to Golovkin. Golovkin lands a good right hook and follows it with a left to the temple. Canelo throws and lands a hard left uppercut to the body. Golovkin lands a left hook to the temple and barely misses with a right cross. Canelo with a good, sharp right cross. They both land a good jab. Golovkin snaps out two good jabs. Canelo barley misses a whizzing straight right hand. Good lead left hook by Golovkin. Canelo lands a lead left hook upstairs. Golovkin lands a right cross and follows it with two jabs. They both land a jab at the same time. Golovkin lands a good three punch combination. 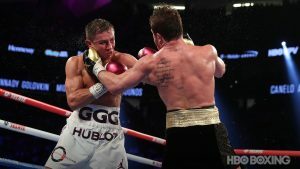 Golovkin lands another jab as the round ends. Golovkin throws out two quick jabs and lands a short lead left hook. Canelo lands two quick jabs and Golovkin lands a short uppercut. Good left hook to the body by Golovkin. Canelo lands a hard right uppercut followed by a good hook. Canelo lands two hard right hook to the head of Golovkin. Golovkin lands a left hook to the head and body. Golovkin is backing away from Canelo. Canelo lands a crisp right cross followed by a left to the body. Canelo lands a short uppercut to the body. Canelo is having a strong round. Golovkin lands a reaching right hook. Both guys look like they are tiring. Canelo lands a sharp right cross. Golovkin with a left hand to the chin. Both guys are showing they have strong chins. Canelo lands a left hook and Golovkin shakes his head no in response. Good short jab on Canelo by Golovkin. Canelo’s cut is getting worse and Golovkin lands a right cross as the round ends. Canelo and Golovkin are exchanging immediately in the middle and both are landing. Golovkin though looks like he is getting the better of Canelo. Canelo with a hard-right hook ot the body. Golovkin lands a hard right to the chin of Canelo and Canelo lands one of his own. Canelo with a wicked uppercut. Canelo barely misses with two uppercuts. Golovkin lands a looping right hand. Canelo looks tired. Golovkin lands two short hooks. Golovkin with a short right uppercut followed by a right cross. Canelo digs in a hook to the body. Canelo with another digging hook to the body followed by a hard right to the chin of Golovkin. Golovkin lands a hard-left hook and both guys look exhausted. They both lands hooks. Golovkin looks a little fresher of the two. Golovkin pressing forward now and flicks out three straight jabs. Canelo eats two short right uppercuts from Golovkin. Canelo lands a right uppercut right hook combination. Canelo gets the crowd on it’s feet with a combination. Golovkin lands a good right cross and Canelo lands a two punch combination. Golovkin with a hard stiff jab on Canelo. Good right hook by Golovkin. Golovkin lands a hard right cross and looks like he may have Canelo stunned. Canelo is firing back and lands a beautiful uppercut. Canelo digs in another hook to the body of Golovkin. Golovkin with a good left hook to the temple followed by a hard right cross. They both land a jab. Good right hook to the body of Canelo by Golovkin. Golovkin lands a left hook/jab combination. Golovkin lands a good right cross. Golovkin lands another good right cross. Great fight. Golovkin is coming forward on Canelo. Golovkin lands a right cross followed by a right uppercut. Golovkin snaps out two jabs and lands a right cross on Canelo. Golovkin is stalking Canelo. Canelo is circling away from Golovkin. Golovkin lands a good right cross followed by a left hook upstairs. Golovkin lands several good power shots on Canelo. Canelo lands three good shots on Golovkin and firing back. Canelo barely misses with a hard right cross. Golovkin lands a short right uppercut. Golovkin lands a little jab. Golovkin barely misses with a right cross. Canelo lands a good right hook. They tie up in the middle. Golovkin lands a good left hook that sends Canelo stumbling a little bit. Canelo with a good right uppercut to the body of Golovkin. Very close round. They tap gloves at the start of the round. Canelo lands a good right uppercut to the chin of Golovkin. Golovkin answers with a good combination of his own. Golovkin lands a hard right uppercut on Canelo. Canelo with a right cross on Golovkin. Canelo with a good three punch combination. Canelo slips on the mat. Canelo with a hard right uppercut to the body. They both look exhausted. Canelo lands a hard right cross . They are both landing and throwing an insane number of punches. Good short right uppercut by Golovkin. Canelo with a good left hook to the chin. Golovkin and Canelo exchanging, but Canelo looks to land the better shots. They both have thrown nothing but power shots. They both look exhausted. Canelo lands a short left hook on the cin of Golovkin. Golovkin lands a three punch combination on Canelo. Great fight. 10-9 Golovkin; 114-114 by Boxing Insider. Many rounds were close and could have been scored either way. The judges scored it 114-114, 115-113, and 115-113 for Canelo Alvarez by majority decision.